"I cannot help feeling sorry for the present generation, who have no idea of these good old times, and my only regret is that I did not live in the coaching days, which I have so often tried to depict in my Charles Dickens coaching series of pictures." Around 1910-11 Raphael Tuck & Sons, Ltd., London, England began to list in its sales catalogs for its Zag-Zaw brand of puzzles a series called "Tuck's Famous 16 Dickens Coaching 'Zag-Zaw' Puzzles" after the originals by Albert Ludovici, Jr. (usually signed "Ludovici") and supplied in two sizes, 400 pieces (20" x 12") and 150 pieces (12" x 7"). With one exception, the series was boxed in the tradtional Tuck box. The one known exception is "Tom Pinch Departs to Seek His Fortune" which is boxed in a special "Dickens Centenary Zag-Zaw" box. About the same time Parker Brothers, Salem, MA began listing in its sales catalogs for its Pastime brand of puzzles a series called "The Famous Dickens Coaching Pastimes" made "only by Parker Brothers from Fine Imported Plates" in the 350 piece size. By the time of its Winter 1911-12 catalog Parker Brothers was listing 16 puzzles in the series. 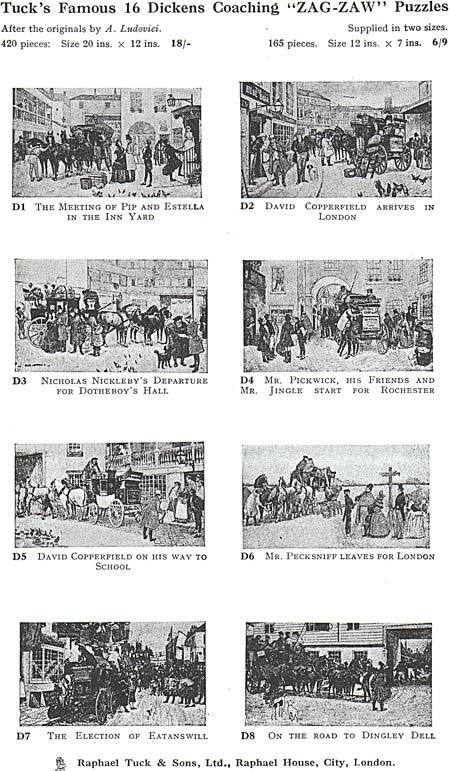 While some of the names are different from the Tuck series, the scenes are the same 16 Ludovici Dickens coaching prints, probably imported directly from Tuck. Note: sometimes the name on the box may differ from the catalog name. For conclusive identification, compare your puzzle with the pictures displayed above and below. Parker Brothers also made 150 piece versions of some of these scenes, although they are not listed in their catalogs and are rare. 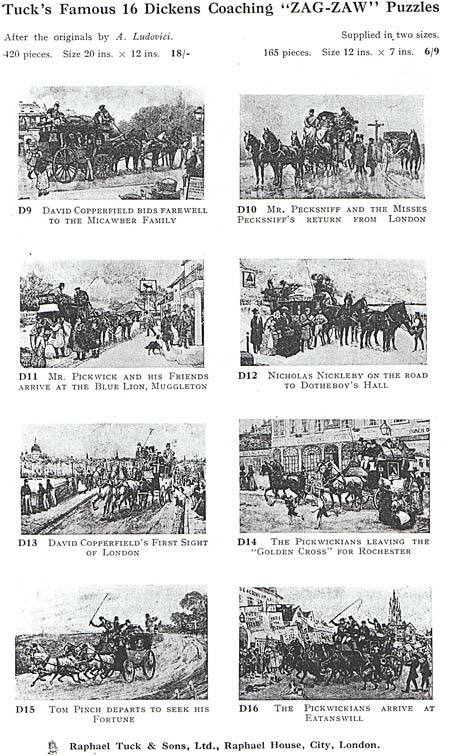 D3 Nicholas Nickleby's Departure For Dothboy's Hall Squeers Meets Nicholas Nickleby and Family at the "Saracens Head"
D8 On the road to Dingley Dell Mr Pickwick en route for "Dingley Dell"
Tuck continued to offer the series for many years after 1912, especially in the 150 piece size. Tuck also offered a 300 piece Multiple Zag-Zaw puzzle combining two Ludovici Dickens Coaching scenes (each in the 150 piece size.) Parker Brothers dropped the series shortly after the 1912 centennial of Charles Dickens' birth, while occasionally making 300 to 400 piece puzzles from one of the Ludovici prints. However, in its January 1931 Pastime catalog, Parker Brothers offered a "Dickens Series" of 4 puzzles in the 350 piece size based on Ludovici coaching scenes, all different from the series of 16 offered back in 1912. While a few other puzzle makers have made occasional puzzles from prints in the series (e.g., Double L's David Copperfield Arrives in London), none have tried to market the entire series of 16. We have also acquired from England a puzzle with a Ludovici scene depicting Mr. Pickwick attempting to drive a chaise-in-four while Mr. Winkle tries to mount a horse (backward). While not showing a classic 4-horse drawn coach, the picture still might be called a "coaching scene" in the broad sense of the word. We have acquired two Ludovici prints depicting what we think are scenes from Charles Dickens' "Pickwick Papers" because both show a short rotund figure in black coat and hat who has the distinctive appearance of other portrayals of Samuel Pickwick. From a study of their catalogs neither Tuck nor Parker Brothers made either scene into a puzzle. We have not seen puzzles cut from these scenes by other makers either. Further identification for these scenes would be appreciated. An extraordinary puzzle featuring all 16 of the initial series of Ludovici Dickens coaching scenes was presented to me at our San Francisco Puzzle Parley April 2007 as thanks for my contributions to the world of jigsaw puzzles. I recommend you view and study Full of the Dickens for the puzzle is certainly one of the finest ever made and displays not only the 16 coaching scenes but also 25 of Dickens' characters. We would be interested in purchasing or trading for 350 pc. Pastimes of these scenes as well as for the Tuck version in the series we do not have. E-mail: We are also interested in identifying Ludovici Dickens coaching scenes in prints or puzzles other than the ones displayed here.